“Bliss in a Skillet.” That’s what my momma’s Chicken Cacciatore recipe should be named. As a little Italian girl, growing up, I just thought that it was one of those dishes that everyone ate at least once a week – just like we did – with polenta or pasta. I also assumed that all Chicken Cacciatore pretty much tasted the same. But many years later, after having tasted Chicken Cacciatore in numerous restaurants, I’m going to finally go on the record and say that Momma’s is the best. You’re going to get to try it for yourself and see if you agree. Momma’s Cacciatore is simple, inexpensive, uses only one pan, and the flavors are absolutely divine. It’s about as close to a fool-proof dish as you can get with the recipe I’m sharing with you today. 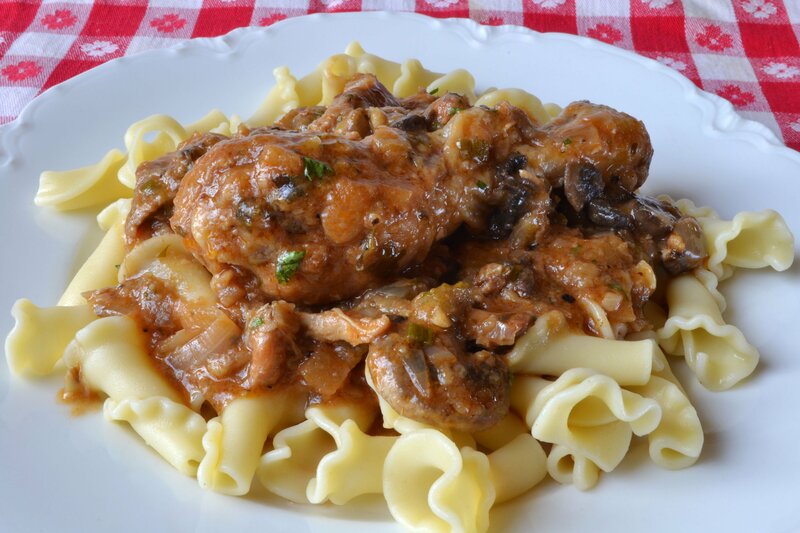 Momma’s Chicken Cacciatore was one of the first recipes we included in our first cookbook, “Momma & Me & You,” and through the years, we’ve tweaked it just a bit to make it even better! I find that high-quality fresh chicken enhances the taste – and that chicken thighs and legs seem to be the most flavorful (flavor-filled bones make all the difference). Pick up a nice bottle of wine, some good sour dough bread, and enjoy one of my momma’s mainstay Italian meals! Wash the chicken and pat dry. Dredge the chicken in flour to coat. In a deep skillet or Dutch oven, heat the oil and fry the chicken on both sides until they are golden-brown. Discard most of the oil, leaving the brown bits in the bottom of the pan, if possible. Add the Marsala and butter, and simmer on low heat until the wine begins to evaporate (about 2-3 minutes). Add the tomato sauce, mushrooms, onion, garlic, green onions, parsley, oregano, and basil. Cover and gently simmer for 15-20 minutes, until tender. Add the salt and pepper to taste. Serve over pasta or polenta.